1. Which is the largest cat? 2. Do tigers like to swim? No, they do not like to get wet. No, they are afraid of water. 3. Lions live together. What is this group called? 4. Which animal makes the best pet? 5. Which cat is the fastest? 6. Which cat has the shortest tail? 7. Which animal is the smallest? 8. What is a baby kion called? 9. Which cat is known for its stripes? 10. Which expensive car is named after the wild cat? 11. Which animal lives alone? 12. 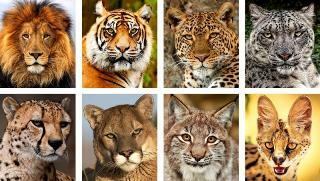 Which exotic cat has a mane?